Available in regular or large size options – perfect for advertising your custom messages in open field events, markets and more. 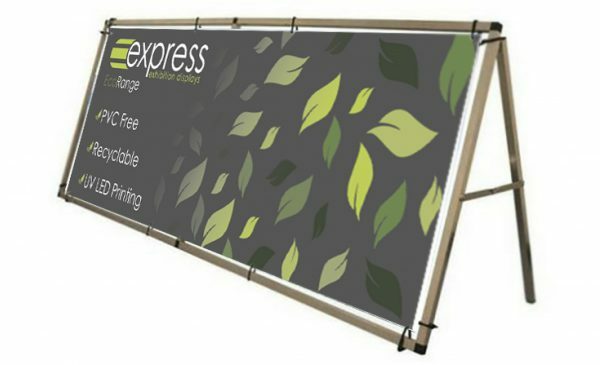 The frame is made from a durable aluminium and is designed to securely hold your eco-graphics to the frame with bungee cords. Our eco-graphic is 100% PVC free, made from a recyclable plastic based material called polypropylene. All inks are eco-compliant and printed using a UV LED print process. Open out a-frame and lock into place. Push-fit the horizontal bars into the a-frame to create the structure. Suspend eco-graphic from frame using bungee cords provided; use ground pegs to secure if required.